After more than a decade of constantly research and successful designs (after a decade the Mandala open baffle speakers in their last step of evolution just won the 6moons Blue Moon Award in 2016 for the second time) Bastanis introduces a new generation of Gemini dipole tweeters and a new generation of AlNiCo magnet 12“ wideband drivers for the upcoming new Sagarmatha open baffle speakers. This and the use of the Gemini MKII tweeters for the other models of the line of speakers made us decide to stop selling speaker- kits. The new generation Bastanis speakers will show many additional fine features and refined look, this wouldn`t be possible for Diy. 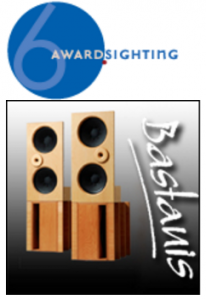 If you are interested in Diy speaker- kits based on Bastanis design please have a look on the Club-27.com website, here you can find more simple and inexpensive but still excellent sounding Diy speaker- kits. For existing Bastanis customers we offer an upgrade- exchange policy to the new gen. AlNiCo wideband drivers, please send us a mail. For a limited period there also are Mandala open baffle Diy- kits (like Blue Moon Award- reviewed at 6moons in 2016) available. This kits are based on new Mandala Chrystal 12“ wideband drivers or returned Mandala Chrystal wideband drivers from upgrade- exchanges, if you are interested please also send us a mail.